Turning to specific publications, MSN.com accounted for all of MSN’s traffic, again with 27 billion page views, followed by ESPN.go.com, with 23 billion; CNN.com, with 8.8 billion; Drudge Report, accounting for all of Matt Drudge’s traffic at 8.5 billion; Buzzfeed.com, at 6.8 billion; Foxnews.com, at 6.9 billion; NYtimes.com, with 6.3 billion; News.yahoo.com, at 6 billion; Cnet.com, at 5.2 billion; and Huffingtonpost.com, at 4.3 billion. In terms of mobile versus desktop, Buzzfeed.com led the way with 63% of its page views coming from mobile, followed by ESPN.go.com at 46%, CNN.com at 44%, and Huffingtonpost.com and News.Yahoo.com, both with 34%. However, a number of smaller publishers had even more page views coming from mobile proportionally, led by Hispanic broadcaster Univision.com at 78%, followed by Health.com at 75%. 5 comments about "10 Publishers Account For Half Of All Online News". David Coker from none, January 29, 2016 at 9:33 a.m.
Maybe I can get banned on my very first post. Main steam media is a monopoly and those that control MSM are well on the way to monopolizing the internet too. Say something they don't like and you get banned. It is not necessary to curse or threaten anyone, just tell the truth about the media. Sites that have banned me for being critical of Zionism are Breitbart, WND, CNBC, all Reuters, SF Gate, NY Times and many others. There is no freedom of speech just the media constantly reinforcing the lie that there is. 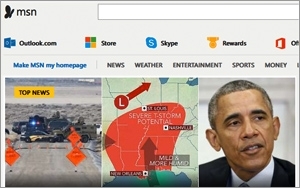 Will Davis from WCD, January 29, 2016 at 10:08 a.m.
MSN's hit count may be related to it being Internet Explorer's default site. Also novice users not knowing how to change their home page. Michael Kaplan from Blue Sky Creative replied, January 29, 2016 at 1:21 p.m.
David - By "being critical of Zionism," I'm guessing your posts were viewed as anti-Semetic, or possible "hate speech." It takes a lot to get banned from both WND and The New York Times. Chuck Lantz from 2007ac.com, 2017ac.com network, February 1, 2016 at 3:57 p.m.
Will Davis beat me to the punch. Any listing that has MSN as a strong #1 in page-views needs to have an asterisk next to it, since, as Mr. Davis points out, it's the default site on a large number of new computers. Without knowing how many of their "views" come from those who haven't bothered to install another default page, and simply click around the MSN opener, any "#1" rating is suspect. Besides that - though this may have changed recently - manually removing MSN as the default doesn't always work, since like The Walking Dead, it often returns to life after reboots unless you do whatever it is you do to kill it once and for all. Chuck Lantz from 2007ac.com, 2017ac.com network replied, February 1, 2016 at 4:27 p.m.
After taking a peek at the top 50 news sites in the US listed at SimilarWeb, I need to add Yahoo to my MSN comment, since that list shows Yahoo at #1, not MSN.